Trish “The Dish” Basanyi is an American Voiceover talent and one of the most proactive and professional female voice over actors in the business today. A full time talent since 2004, she is routinely retained by Fortune 400 companies to complete a diverse list of voice over services. Browse through the site to find out why so many people turn to Voiceovers by Trish, to meet their voice talent needs. Her voice over acting is widely used in all genres of voice over including radio and TV commercials, corporate multimedia projects, narration for streaming video, DVD marketing promotions, healthcare marketing, web audio, mobile phone apps, pre-roll ads, direct response (DRTV), e-learning narrations, real estate virtual tours, podcasts, product marketing by corporations on DVD, corporate office on-hold phone systems, casino/night club promotion and more. Voiceovers by Trish can provide specific voice over demos and samples per your needs if what we have in our demo page doesn’t meet your needs. Contact us for quick one call results. Stating Trish is proactive in the voice over industry may be an understatement. She is a regular feature and co-host of the popular Internet program, the Voice Over Cafe, where some of the industry’s top Voice Talent are interviewed and where secrets are shared. 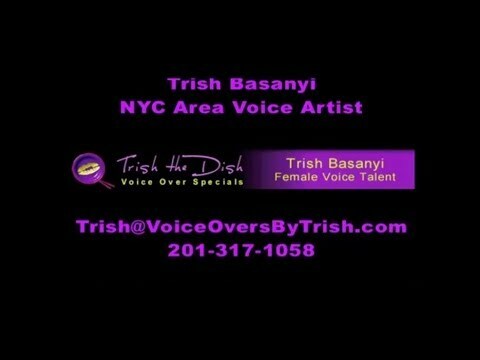 Trish is also the goto person If your in search of Voice Talent. It might do you good to know that Trish Basanyi is a gold mine of talent resources. She has founded the Voice Talent Directory and Job Board Voice Tweet and the bilingaul Spanish voice talent job board Voice Casa. Voice Casa pre-screens, professional bilingual Spanish voice talent and makes it a breeze for the Talent and the Talent Scouts to connect for your next multimedia, audiobook, IVR/phone, or e-learning project! Voiceovers by Trish is more than a slogan, its a service delivering fast turnaround from her broadcast-quality home studio in the NYC area, Trish can voice and edit your project quickly, and gets it right the FIRST time. Learn more about voice over actor Trish Basanyi and voiceovers by trish, by listening to her demos or contact Trish now for your next voice over project! Copyright (c) 2018 Trish Basanyi – All Rights Reserved.